Michael Hendry has posted another great result after finishing in a tie for second place on the Japan Golf Tour. The North Harbour professional finished at 10-under par for the four rounds, five shots behind the Japanese poster boy Ryo Ishikawa in the Rizap KBC Augusta. 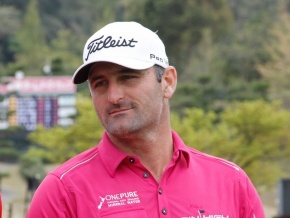 The 36-year-old moves into fifth place on the Japan Golf Tour Order of Merit, after winning $97,730. This continues his streak of six Top Ten performances this season. Hendry has now amassed $596,000 in Japan this year. Fellow New Zealander David Smail missed the cut in the same event, leaving him in the perilous position of 78th on the Order of Merit. The next best of the Kiwi performances came from Lydia Ko, who competed in what is considered to be her home away from home. The 19-year-old Kiwi phenomenon finished in a tie for seventh place at the Canadian Pacific Open, a tournament she has won three times before, twice as an amateur. Ko will go into her next event, her Evian Masters defence, ranked Number One in the Race to CME Globe. Ko finished at 13-under par for the four rounds, which left her 10 shots behind the World Number Two Ariya Jutanugarn. The dominant performance from the Thai golfer closes the gap between herself and Ko in the Race to CME Globe, and can potentially snap up the Number One spot with another great performance next week. Despite missing this week’s cut on the Challenge Tour, Ryan Fox remains in good position to gain entry onto the European Tour for 2017. Fox fired rounds of 68 and 73 around the par 72 layout, to miss the cut by a single stroke. The Auckland professional is in third position in the Road to Oman, where the top 15 golfers gain full status on the main tour for the following year. Danny Lee also missed the cut in his first playoff event on the FedEx Cup, The Barclays. The Bay of Plenty professional missed the cut by two shots after firing rounds of 74 and 73 around the par 71 layout at Bethpage Black. Lee now drops 14 spots in the FedEx cup rankings to 85th, but still advances to the Duetsche Bank Championship this coming week, but needs to fight his way inside the Top 70 in the FedEx cup rankings if he is to advance to the following event. There is also a change at the top of the FedEx cup rankings with American Patrick Reed taking over the number one position. The 26-year-old came away with the spoils and looks to be the first person since Vijay Singh to win both the Barclays, and the FedEx Cup in the same season. Steve Alker has managed to make it into the Web.com Tour finals as held into his spot in top 75 following the final regular season tournament. The Hamilton professional finished on four-under par for the four rounds at the WinCo Foods Portland Open. That sees the 45-year-old finish 64th position on the order or merit, keeping his hopes of gaining his PGA Tour card through the Web.com Tour Finals alive. Stacey Tate has also recorded a credible result on the Ladies European Access Tour, finishing in a tie for 34th position. Tate recorded a 10-over par total for the three rounds, finishing in the middle of the pack and 10 shots behind the winner. She sits in 61st position on the Order of Merit, and has work to do if she wants to gain entry onto the Ladies European Tour with fellow countryman, Cathryn Bristow. Three New Zealanders also competed in the first stage of the LPGA Qualifying School. North Harbour professionals Jenna Hunter and Rica Tse, along with Auckland representative Munchin Keh, were all looking to take the next steps in their young careers by making the move onto the main tour. Keh was the only player to make the three round cut with a total of 4-over par, but would agonisingly miss out on stage two of Qualifying School by a single shot.